Due to Hurricane Irma’s approach, FUELSnews Daily will only include Today’s Market Trend. We will send out a Storm Alert later today. Crude prices are flat this morning, after trading sideways yesterday. 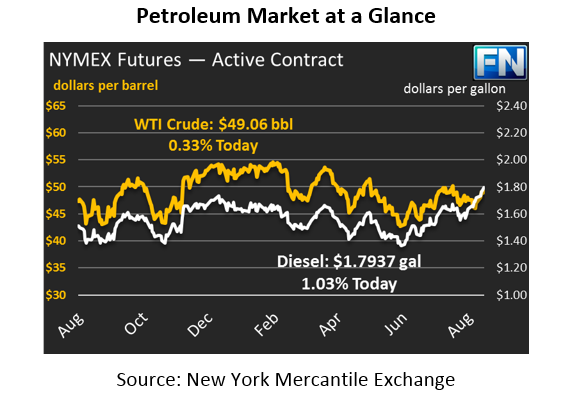 Crude prices began yesterday at $49.14, and ended the day at $49.09. This morning, they’ve slipped to $49.06. With markets focused on Hurricane Irma’s impact on Florida, trading volume has been light. Refined products saw a bit more activity yesterday. Diesel prices rose 3 cents (1.8%) yesterday, continuing the upward price trend. Diesel prices are currently $1.7937, up another 76 points from yesterday. Gasoline slipped a penny lower, down to $1.6610 at close yesterday. Gasoline prices today are mostly flat at $1.6662, half a cent higher than yesterday. The dollar has been trading sharply lower this week as traders feared Harvey and Irma’s impact on the economy. The storms’ destruction has made the odds of a December Fed interest rate hike vanish. The falling dollar has helped give oil prices support, preventing a decline there as well. The EIA produced their inventory data yesterday, which as expected showed the effects of Harvey. With refineries offline and consuming less crude, crude stocks saw a 4.6 million barrel (MMbbls) build, while refined products were both drawn down. Refinery utilization fell below 80% as a significant portion of U.S. refining capacity fell offline. Overall, the report revealed no new news, and markets mostly ignored the results. Hurricane Irma has shifted west, and many forecasters are now expecting the storm to travel directly over Florida and continue into Georgia. This path means that the strongest winds, which occur at the north and northeast parts of the storm, will pass firmly over Miami, bringing catastrophic damage to the city.